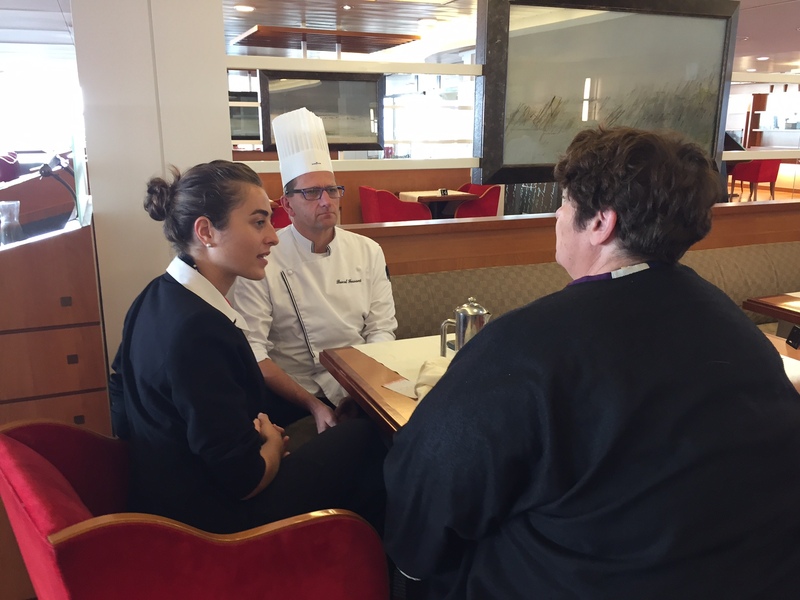 Top class and highly professional: catering for passengers on a cross-Channel ferry is a 10-hour a day job according to Pascal, the head chef of Mont St Michel Brittany ferry. Other than the odd pizza and bread, he and his kitchen team make every dish served on board from scratch. Even the croissants and patisserie are made on shore by other Brittany ferry chefs. It can be a tough regime: working a 70 hour 7 day week before rotating with the twin kitchen team and getting some down-time. But clearly, these are careers that give enormous personal and professional satisfaction: Pascal has been doing it for over 25 years and many of his chefs are long-term colleagues. Every one of them undertook a professional apprenticeship before joining the company and, while all live in France, they are a multi-national group with chefs from France, Britain, Germany and Spain. Like any successful restaurant, Pascal aims for consistency: many of his customers travel frequently on the ferries and want the comfort of their favourite dishes to be just as good as the last time. On the other hand, it is probably not surprising with so many English passengers that their favourite food is that old, nostalgic and familiar stand-by – fish and chips! I was slightly more adventurous: fillet of sea bream with Puy lentils – absolutely delicious and something for me to learn for Baking blind. 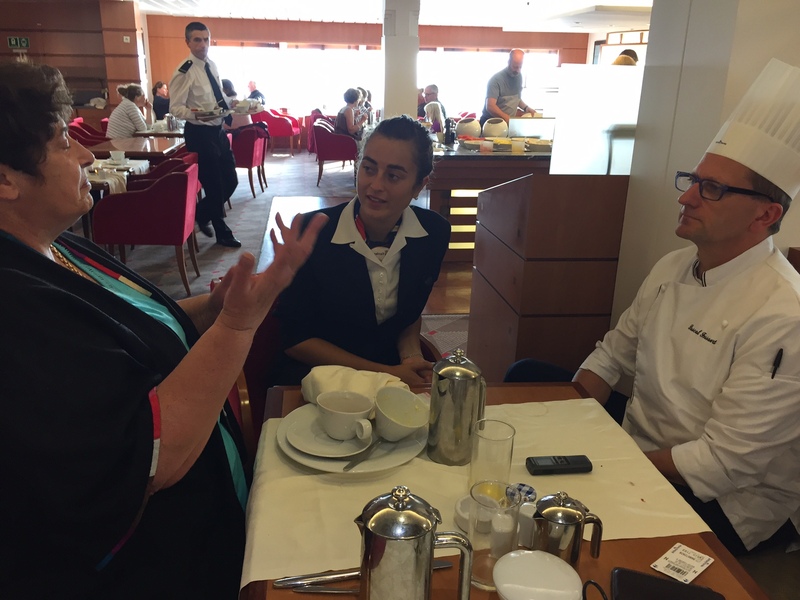 All the crew I met on board – from the Purser to the reception staff – were unstinting in their help while transition from shore-side to ferry was easy for anyone with a disability: specific assistance with our own accessible mini-bus, help with luggage and then guidance on board. There are special cabins for those who want such. And for fans of opulent luxury, I was travelling back from a weekend at the fabulous Le Royal Barriere Hotel Deauville. Directly associated with the famous polo club, there was a big event over the weekend. Two teams of polo players and their horses all gathered in the hotel forecourt –a magnificent sight was described to me and even I appreciated the clip-clop of their hooves. In the evening, under a glorious sunset, the ponies were cooling their hooves in the sea – I’m not sure what the equine equivalent of paddling is! 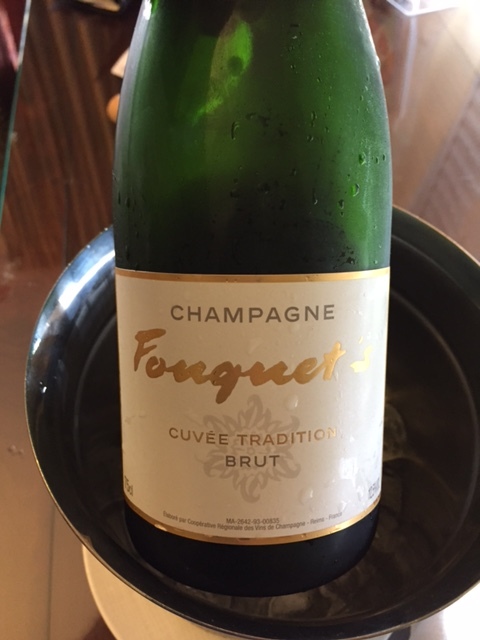 This is a hotel for serious indulgence: vintage champagne in the correct glasses, stunning lobster in Bouillabaisse sauce with aioli croutons, amuse bouche and more. Most striking for me was the fragrance that pervaded all the public rooms: warm cedar that gave me a strong sense of the grandeur and solidity of this splendid building. The flower arrangements were just enormous: floor standing vases with some of them taller than I could reach (so over 2 metres) before the foliage and flowers even started. 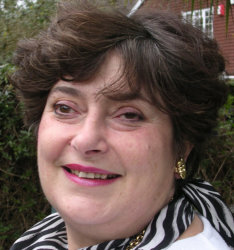 The staff are immaculate, solicitous and attentive – just what you need when managing a new environment without sight. Highly recommended! ← Feast from fridge ferreting.